Moments before disaster struck. Here’s some tips to avoid this happening to you! 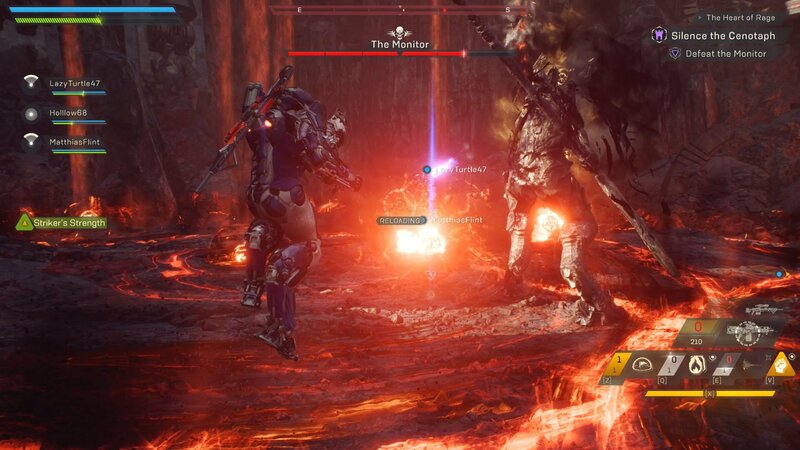 Learning the Scelos fight last night taught me something about Anthem. It’s difficulty shares some parallels to WoW. Anything below Grandmaster and the mechanics can be preeeetty much ignored (or at least not fully understood) just like in WoW’s normal dungeon or PUG Raid (LFR) difficulties. Crank that switch up though and things start to matter. In order to do this as a Stronghold, you need to have gone through the encounter as part of the Story so you would have seen it already. But as a bit of a recap The Monitor-ascended has three-major phases to it. 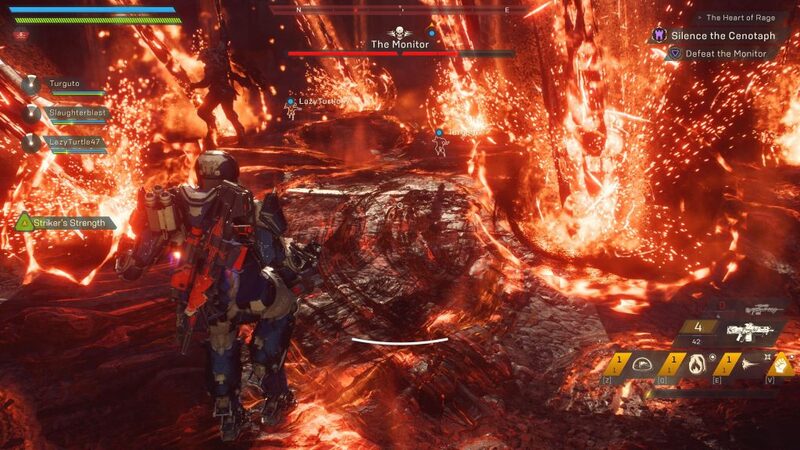 Phase 1: The ‘ow hothothot’ phase, where the floor, the sky, the boss the boss’s weapon (and sometimes your Javelin) are lava. Phase 2: The ‘ow I’m melting’ phase, but this time it’s acid burn. Phase 3: The ‘ow-‘ ZZzzzT! Lightning phase. Of the three I think the first phase is the roughest to get through, especially if you’re not sure what’s going on or if enough of your party doesn’t know what’s going on. The first time I encountered this mechanic, I assumed it was intended that we find a safe spot on the ground and run to to it. That’s a trick, a dirty- dirty- trick. By the time they’re ready to go critical and explode, they’ll be covering about 95% of the arena floor. You can fly above and treat the floor like lava during this phase, but this is risky business if you get knocked out of the air before they’re finished turning everything at ground level to bacon. There is a secondary bonus to destroying the Meteors before they can detonate as well. Destroying the meteors gives you a crazy amount of ultimate charge. 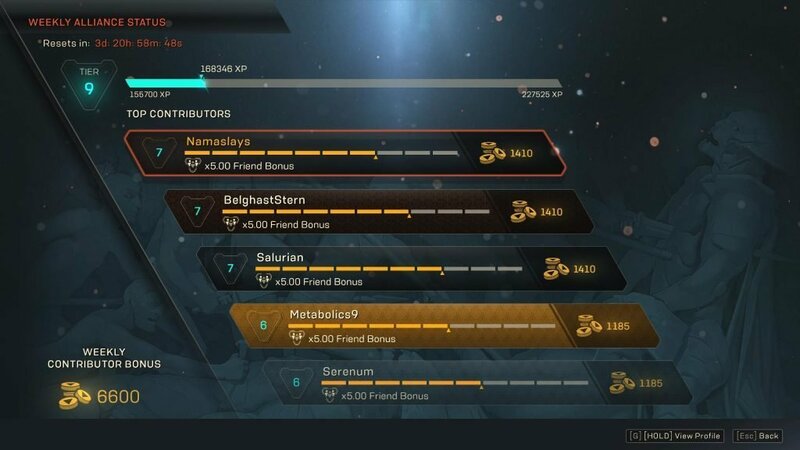 Destroying even a couple each round of meteors will see you being able to get several Ultimates off before it pushes into Phase 2. The expanding rings around each meteor are safe to be in before they explode, you can run right in close as you’re destroying one to make sure you don’t accidentally get hit by an explosion from another nearby meteor. There are no adds to worry about in this phase either, so you can position yourselves as you see fit around the room. 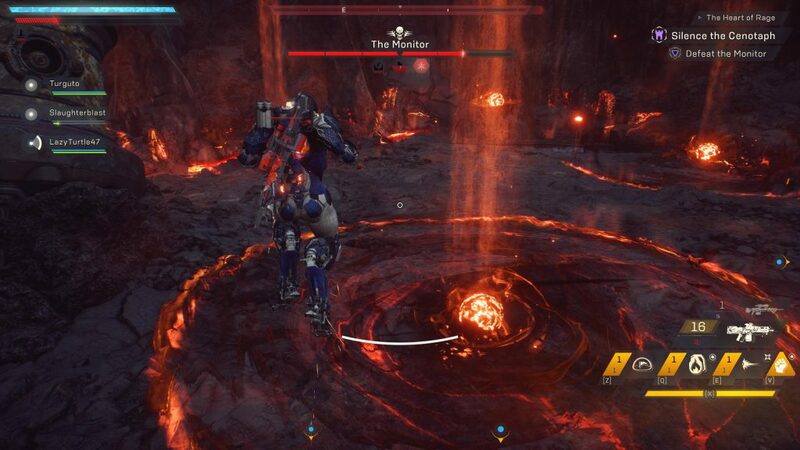 I’d suggest not stacking too tightly due to the leap attacks and fire orbs, but if you see someone who is struggling with clearing a patch of safety around them in the Meteor phase, it’d be better to hang out nearby and help them than to let them take that damage repeatedly. It’s intense. If the fiery orb is floating above the ground — it’s a trap! You can’t destroy those ones, they just simply explode. Mechanically they’re very similar to the stationary fire-orb explosions that Titans do. Just back away from these and don’t let them explode on you. #3 signals the end of this phase — you’ll have time to regroup before flying to the next arena if needed and bring up your fallen if needed. After all that for Phase 1, Phase 2 and Acid will probably feel like a cakewalk. The main new addition here is Mordant Elementals who will be a near constant companion during this phase. 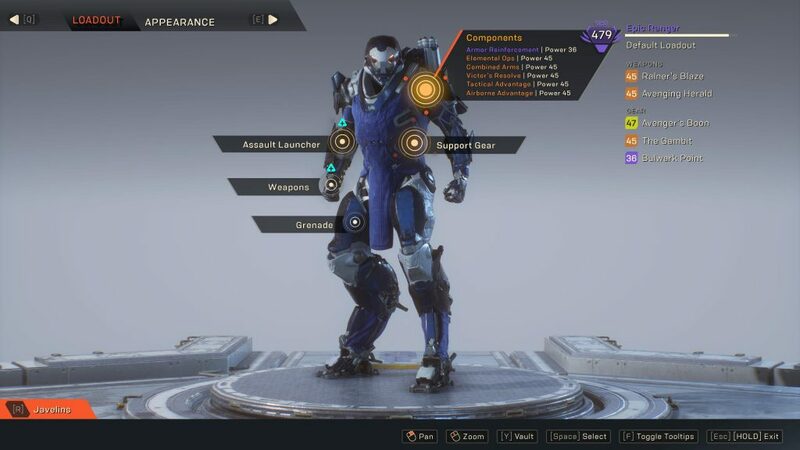 Like any other elemental you’re likely to encounter in Anthem, they would love dearly to come up to you and give you a hug. It’s just a shame that their hugs come in the form of an acidic shower. Work on killing these rather than letting them build up, but you can achieve that simply through pretending to want a hug and walking up to them — to jump and dash away right after if you’re one of the more agile Javelins. Meanwhile, The Monitor won’t be jumping around as much any more and slamming halberds through your party, but he will Teleport around the place. You’re generally most safe to stay positioned on the platforms in the room, although despite appearances the liquid at ground level will not innately damage you. As well as offering splatter-hugs, Mordant Elementals who you gain sufficient distance from will instead spit acid at you. Yes, rather unpleasant. The Monitor will do this too, but it will come in quite a wide torrent. For this reason it’s best to keep some distance from him. If he teleports nearby your platform, relocate to another. On top of this, The Monitor will occasionally bring back his explosive orb trick — of course, this time attuned to Acid. The final phase, and the second most difficult in my opinion. The main new mechanic here to watch for is domes of exploding electric energy, which then course a wave across the entire arena floor. These can come from any direction and often overlap each other. It does damage at ground level, so staying above it — either by hovering as much as possible, standing on the various pieces of machinery in the area, or timing your jumps to pass it by harmlessly beneath you is up to you. Learn the sound it makes though as the wave starts, as it may save your life. Taking a single wave probably isn’t going to kill you, but taking one followed by a sequence of homing electro balls might. There on the ground — that’s the precursor to the energy wave. Now, YMMV on this — but I found with my latency2 I had to jump a bit before what was visually suggested to me. In the video I’ll include below, you’ll see a few instances where I jumped over and still took the damage, and a few more where it appears I landed ON the effect and got by unscathed. As you approach the final 1.5 pips of health, he will go berserk — crouched in the centre sending continual shock waves out. It is my belief that the orbs of light in the barriers in the arena are meant to protect you from the wave attacks. The barrier also cannot protect you from the homing lightning balls. But it seems that the barrier can protect you from just the waves of energy. I think when I take damage from a wave, I have juuuust inched my way out the back end of the barrier and therefore lost it’s protection. If this is true, it might be an easier means of avoiding damage from that mechanic, but it isn’t infallible so keeping mobile except in times of dire need might work just as well and is probaaaably what I’ll continue to do. I benny hill an elemental around a platform for a while in, launch a grenade at a different unsuspecting platform and fire a devastator round into an equally unsuspecting wall. Fun times. Nonetheless, the attempt was successful and it might help in visualising some of what I’ve talked about. Went into Scelos fight tonight on Grandmaster 1 after previously only having done Scar Temple on hard. To start with, Scelos was an exercise in frustration. “Oh for Fart’s Sake,” or perhaps something, um, similar, was heard over our Discord on more than one occasion. The core problem was that we were over-cocky bastids at this point. 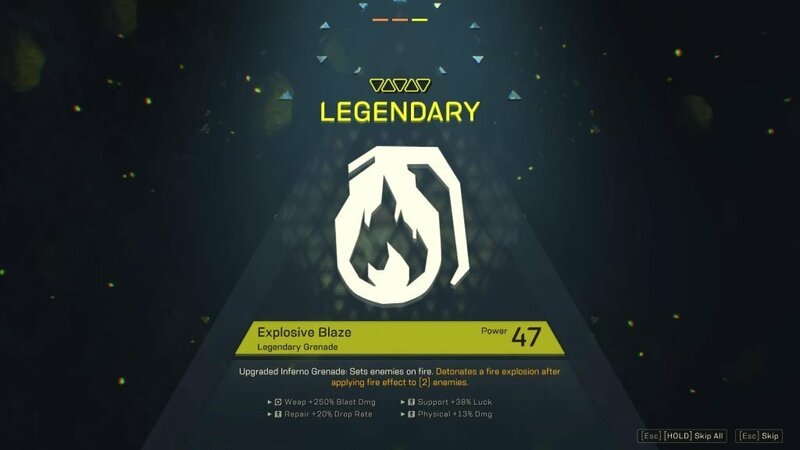 Even Legendary Contracts on GM1 were starting to give us that feeling of super-human power again. Take that attitude into Scelos’ lair though, and he ain’t having a bar of it. In case you’ve not yet seen or done this fight full-stop; the basic mechanics of it are that Scelos has fused himself into the form of a very large Escari shell, with all the fun and games that entails. Waves of devastating missiles and withering machine gun fire being the specials of the day. Add to this though that every so often three giant shield generators around the room will power up and render Scelos invulnerable. 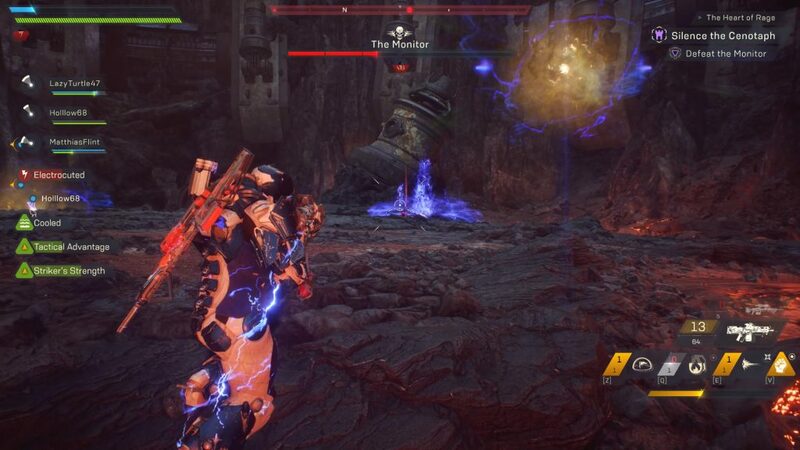 Each generator must be taken down before Scelos can be damaged again, but also during this phase additional Scar support units will spawn in, with increasing intensity each time this phase is activated. Note that even while shielded, Scelos would love nothing more than to ruin your day with an unasked for Missile-enema. Queue the tips — aka: The things we did wrong on the first two attempts that we corrected for the third. Be mindful of where the fans are — they will hurt you if you’re taking their blades to the backside. They also activate with very little warning. Fan activation appears to be boss HP based rather than time alone, but it isn’t directly related to passing from one ‘pip’ of Scelos’ health into the next. Nonetheless, crossing that threshold is when we started to be extra alert for the fans starting, and making sure the cover we were currently using wasn’t right in front of one. Moving in a group (or at least pairs) from cover to cover is good during the shielded phase. Pack mentality for handling the scars is the way to go. Focus fire the threats (Hunters, Scouts) then take out the little guys. If Scars spawn right into your cover, fly low and fast to another clear cover. You can barrel role (or shield) your way through this cleanly most of the time. Move around the room in a circle, clearing fans as you go and is safe. 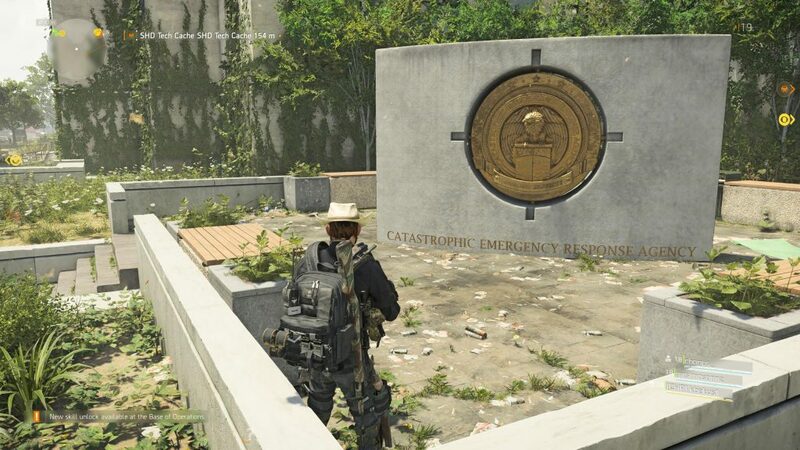 If there are Scars up in another part of the room, have someone not focus the shield to keep watch on what’s happening on the ground rather than in the air on the generator beams. Opposite is true for the damage phase — spread out for this. Assuming you’ve cleared the Scar reinforcements out before downing the final fan beam, you can and should safely spread to different sets of cover around the room. Scelos’ turret tracks very quickly but still must aim to fire. The current target of Scelos’ ire would ideally notify rest of the team that it is (briefly) safe for them peek and poke with prejudice. Bonus points if you can get that poke on ol’ Scelos’ bad knee (a common weakpoint for Escari). And that’s basically it. Scelos hits hard and fast, but isn’t as unfair as first impressions may seem. An example: His missile waves do incredible damage and have a force component meaning you can be knocked about if hit. But they do have a fair travel-time component, and there is always time to react between the first salvo and the second salvo, even if the first pummels you. Taking that first salvo isn’t too bad, but the second as well? Definitely no bueno. And that should be about that. This level of co-ordination is likely going to be difficult with PUGs to start with while people learn what is required of them. If you’re playing in this scenario I think the best you can do is to attach to one of the group while in the fan phase, keeping the Scar population around them to a minimum, and keep working on the Scar if for some reason your group leaves them up into the next boss damage phase. You really don’t want to have to be dealing with your cover spots from the boss becoming increasingly dangerous with Scar swarming around as well. Otherwise, keen to hear how people are finding this encounter on the higher difficulties. I went from making grumpy faces at it to having a newfound respect for the mechanics after managed to shift out of the mindset that current gearing has allowed for in other content. 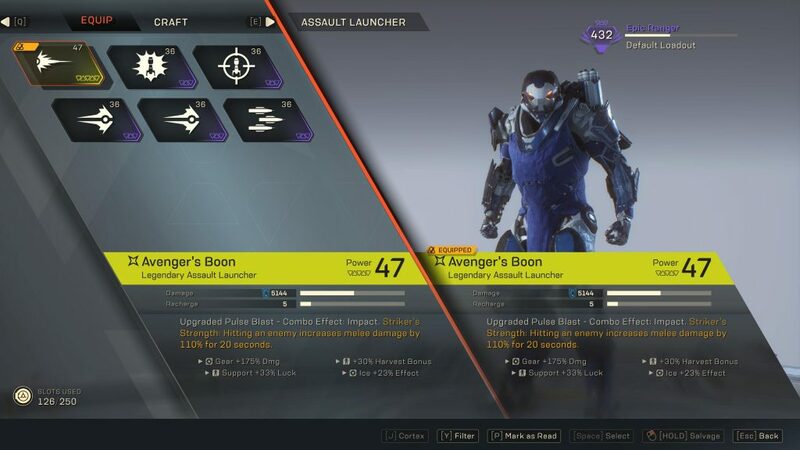 BioWare told us that Strongholds would be the pinnacle of challenge for the launch game content — and it seems they meant it! The February 22nd Day 1 Day -1? patch came out yesterday, in advance of the launch for all comers today. 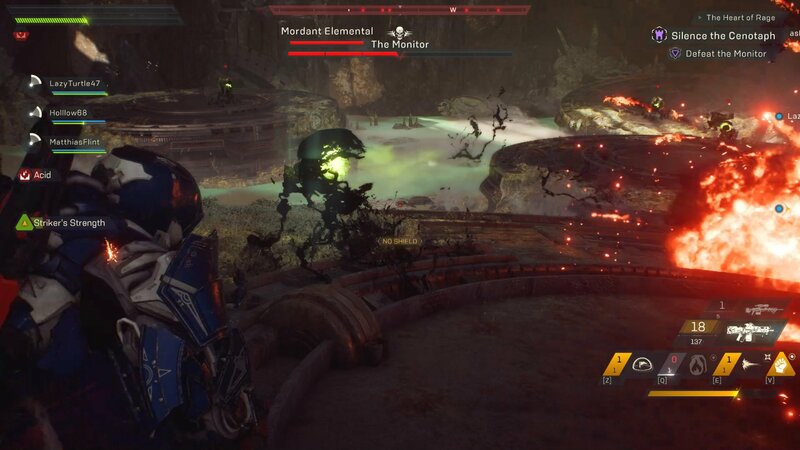 It has a wide array of changes and fixes, with the official list of changes from BioWare here. It seems an incredibly positive list overall, and my experience with it so far would back that up. 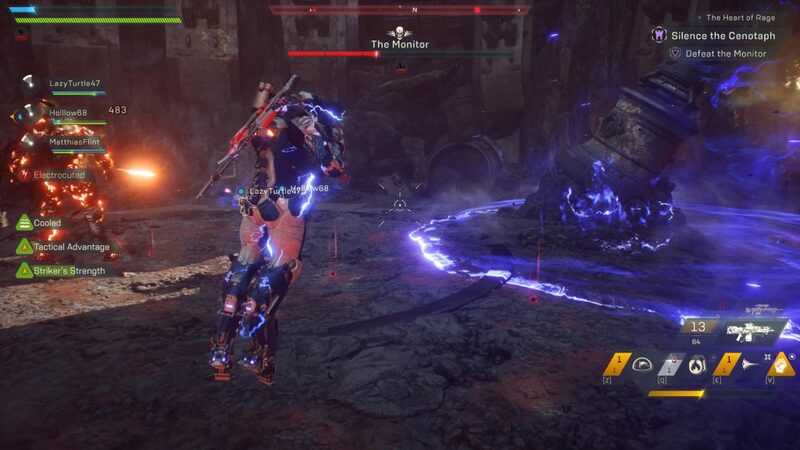 A PSA though: If you’re using nVidia drivers 418.91 (The latest as of Feb 22nd), this version of Anthem does not like it. I personally had issues with the game hanging on quit with a black screen until force-terminating the game. Others though have reported jittery framerates and micro-freezes that reverting back to 418.811 seems to resolve. Besides that, I also found a few changes not in the patch notes! I’m sure there are others, but here are some of the big ones I found not covered in the notes. Not an insignificant boost. In the old screenshot one of my friends was at the time Rank 9 (of a possible 10) and was providing 540 coin. 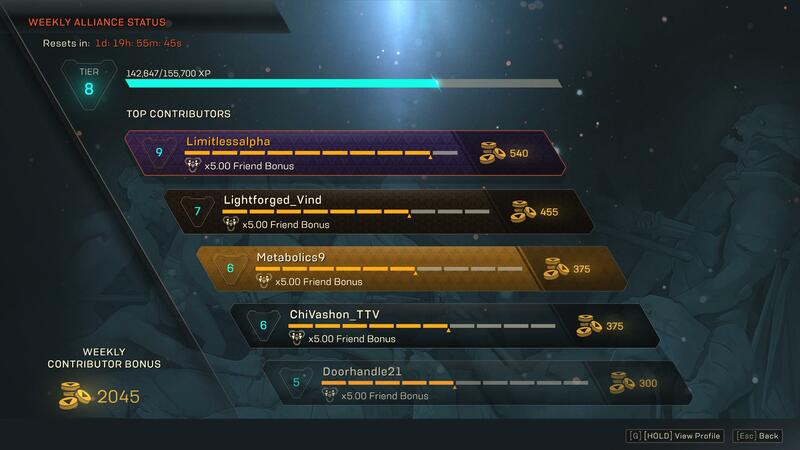 Now you earn more than double that amount from at least Rank 6 upward. A very positive change, but one I had momentarily thought was in place of what were previously pretty good coin rewards from basically any daily/weekly/monthly challenge available. Thankfully the missing/reduced coin from these challenges is a bug. Hopefully one we’ll see resolved soon! 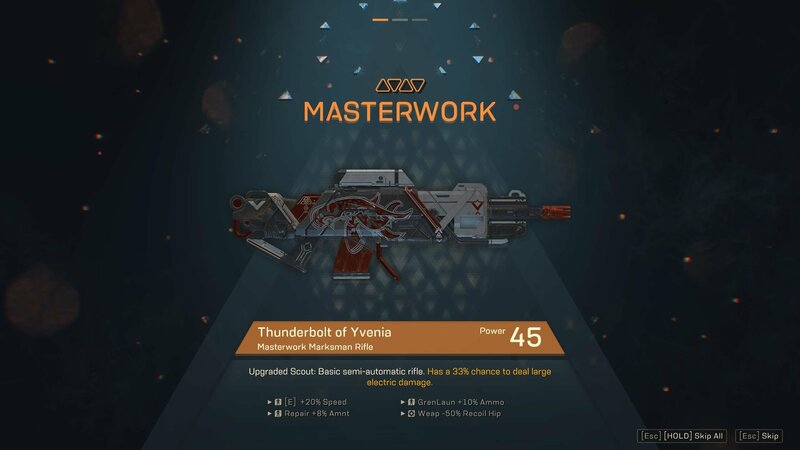 Completing a Stronghold or Legendary Contract on Grandmaster 1 or higher difficulty now guarantees a Masterwork (with I assume, chance at a Legendary). So even if you’re incredibly unlucky during the mission itself and don’t manage to get any MW’s to drop for you — just know one will come in the end. 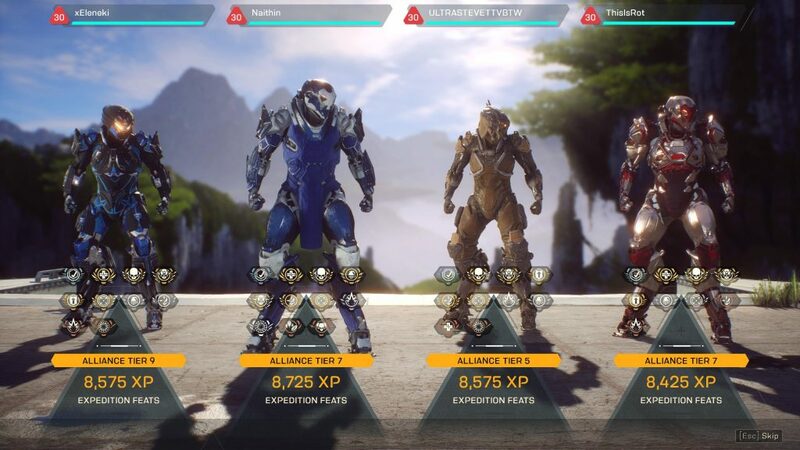 If you made it to Grandmaster difficulty before the patch, you might’ve noticed that the XP gain was tiny compared to what you would get on any other difficulty. Turns out not though, and GM xp has been buffed by a factor of 8-10x. OK, this one might’ve actually been in the patch notes. But it’s just too good not to mention. Pulse Blast is an absolute shield destroyer now. Don’t leave Fort Tarsis without one of these in your party for near on instant knockdown of Scouts, Hunters, Elementalists or any other pesky shield-wielder you care to name. How’s my Build Coming Along?